The original statue has been moved, and a reproduction placed on the river bank overlooking what had been the main harbor in Raffles' time. On first seeing Singapore, which was then a small fishing village, Raffles, a particularly forward-looking and benevolent agent of the East India Company, grasped its potential as an entrepot (or trans-shipment) port. He thereupon purchased the island for the East India Company from the Sultan of Johor and invited Chinese and Indians to immigrate to the new town, thus inaugurating Singapore's present multi-cultural society. 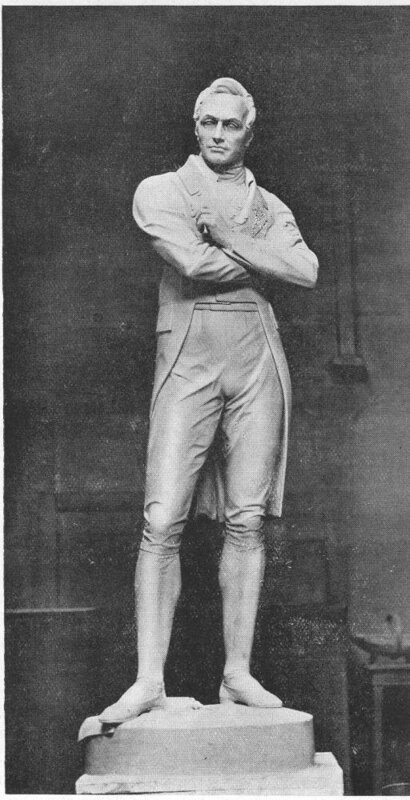 During the short time that Raffles visited Singapore, he founded a girl's school and other institutions. Woolner, Amy. Thomas Woolner, R. A.: Sculptor and Poet. New York: E. P. Dutton, 1917, facing p. 313.